All of the features of the CPT Standard book, plus additional enhancements! Color coding, icons, and bars make finding and understanding CPT codes easier by identifying section headings, coding changes, coding alerts, and anatomy illustrations. The official industry CPT® code book. CPT 2019 Professional Edition is the definitive AMA authored resource to help health care professionals correctly report and bill medical procedures and services. The AMA publishes the only CPT code book with the official CPT® guidelines. Providers want accurate reimbursement. Payers want efficient claims processing. Since the CPT® code set is a dynamic, ever-changing standard, an outdated code book does not suffice. 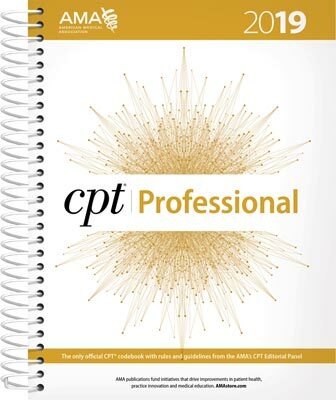 Correct reporting and billing of medical procedures and services begins with CPT® 2019 Professional Edition. Only the AMA, with the help of physicians and other experts in the health care community, creates and maintains the CPT code set. No other publisher can claim that. No other code book can provide the official guidelines to code medical services and procedures properly.